If you are like many women, you may feel quite an urge to reclaim your body for yourself after pregnancy. You no longer have a little lodger hanging out in your abdomen making it hard for you to move about, and working out can be a great way to get a little bit of ‘me-time’ in between feeding and cuddles. Or maybe you just want to fit into your favourite pair of pre-pregnancy jeans once again! While exercise is definitely a great life choice, there are a few very important considerations to keep in mind in order to start exercising, post-baby, safely. It is actually possible to do more harm than good if you start too quickly or work areas that require time to heal. As you now know, pregnancy and labour are monumentally challenging physical journeys. When you made that transformation from woman to mother, your body changed too. Keep these tips in mind and you can get your fitness levels back up post-pregnancy. Just be patient! You’ll get there. We wrote recently about the changes to your body during pregnancy and how to consider these when exercising safely – and post pregnancy comes with its own set of guidelines too. After giving birth, your body does not instantly pop back into form. In fact, from stretched abdominal skin to loose joints, it may take at least six months before you really start to notice things go back to normal. Even then, the changes are still gradual. The hormone relaxin is still in your system post-pregnancy and may cause your joints to feel unstable or wobbly for up to six months after labour. This means that a competitive game of tennis or one-on-one basketball with your teenage nephew is not a good idea. You will also want to avoid strenuous running and jumping for those first 12 weeks after birth. Your pelvic floor has weakened after carrying your growing baby for the past 9 months, so don’t put any undue pressure on your pelvic floor muscles through heavy lifting or squatting (this includes your three-year-old). Weights and squats can wait until at least three weeks postpartum. To accommodate your growing baby, your abdominal muscles will have separated – so no crunches after giving birth! This is one of the biggest areas where women can get into trouble and actually do damage. Though you may want to tone up that belly after 9 months avoiding ab exercises while pregnant, jumping into sit-ups, crunches, and other ab exercises is not a good idea. Be patient with your body – much of the softness is actually your uterus taking its time to shrink and your skin slowly returning to its normal shape. It is so important to stay hydrated, just as it was when you were exercising during pregnancy. Be sure to drink extra water, even during light exercise – especially if you are nursing. Pay attention to your bleeding. As a general rule of thumb, avoid everything except for light walking, pelvic floor exercises, and postnatal abdominal bracing until you stop bleeding or until your health care provider instructs you to do otherwise. And if you do notice that bleeding returns after increasing your exercise level, this is a sign to scale back again. Eat really well. Postpartum is not the time to diet. You need lots of nutrient-packed foods in order to recover and to keep your mind and body strong to cope with all the new stresses of being a mother. 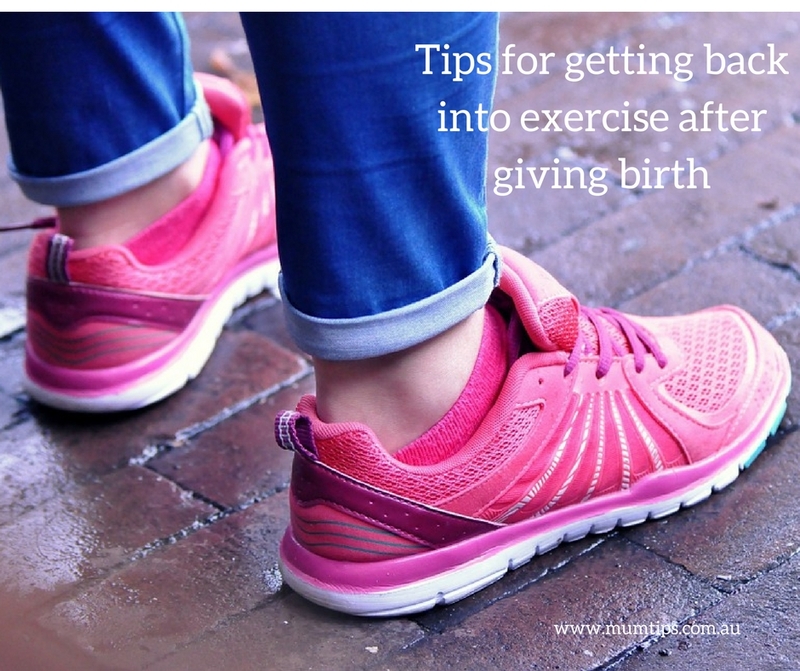 Getting back into fitness after birth can be daunting. As crazy as you know it is, your softer body and your lower fitness levels can make you feel self-conscious stepping back into the gym – and the risk of bleeding through your workout tights is a constant worry. It’s important to feel comfortable as you build up your fitness once again, so it’s often best to start out at home while you’re building yourself back up. Not to mention the convenience of being able to catch a quick 30-minute workout while your baby takes a nap in the next room! Many gym equipment stores (like Orbit Fitness in Perth!) offer interest free payment plans on equipment like treadmills and home gyms, which essentially allows you to take home and use the gym equipment immediately and the repayments work out about the same as a weekly gym membership, so it’s easy to set up a little workout haven in your spare room. If your body feels tired, take it easy. In fact, you should treat yourself to a soothing herbal bath, a massage, or even a nap. You’re a mum now – you deserve some tender loving care too! So, what can you do to get into shape? For the first three to four weeks, do the activities listed above that are suitable while your body is still bleeding. Once you get beyond that, you can start swimming, lifting light weights, and increasing the impact of your walking workouts, as long as you feel up to it. The following sample fitness routines were designed so you can do your workouts at home, as advised above. With light weights (ten pounds or less) do two sets of ten bicep curls for each arm, shoulder raises (from a resting position, bring each arm up to shoulder height, palms facing down), and tricep exercises (extend your arm over your head, weight in hand, then bend your arm to a 90 degree angle, palms facing towards your head, return to extended position). Strengthening exercises listed above, add leg and core strengthening exercises such as lunges, weightless squats, and plank. By six months, you should be well on your way to your pre-pregnancy routine, whether it was rock climbing and kayaking or jogging with a friend. Be sure to talk to your doctor before exercising – every woman is different and should follow her own unique needs. Also, keep in mind if you have had a caesarean section, it is important to increase your healing time and to consult with your health care provider about what exercises are safe and when. Nevil Hunter writes for Orbit Fitness, one of Perth’s leading chains of Fitness and Gym Equipment Suppliers, with eight locations across Perth – in Osborne Park, Cannington, Joondalup, Booragoon, Malaga, Rockingham, Bunbury and Mandurah. Orbit stocks all the leading brands of fitness equipment – from treadmills, spin bikes and cross trainers to weight stations, home gyms, smaller equipment and apparel, with options to suit all budgets.